Last week I took Noah to Sears to get his picture taken. When we arrived, he was very cranky. Not sure why, I was thinking maybe he was afraid of the balloon? He wasn't his normal self. We always see the same lady at Sears and she even commented that he wasn't as photogenic as usual. OH well, so we went along and took a few pictures in his "birthday outfit" and some Valentine pictures. They came out really really cute, despite him being a sour puss! 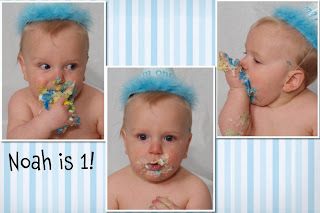 Well, I also brought along a small cake and balloons for his "smash cake" pictures. It's hilarious, they came out great! I was suckered into buying the whole cd because there was NO way I could choose just a few pictures. At first he just started out touching it, not realizing he can put it ALL in his mouth and actually eat it! Well let me tell you, he was a grand mess! Icing got everywhere! His face of course...on his ear...hair...legs...toes! I think it's safe to say that Noah looooves cake! He was so messy and gross we had to clean him in the SINK!